There are thorns in the beds of roses knows Camella Lobo when presents a new mix for the Lithuanian webzine Secret Thirteen. Known as the musical partner of Juan Mendez in Tropic Of Cancer, Lobo expresses her fondness for the industrial and wave scene across the years. 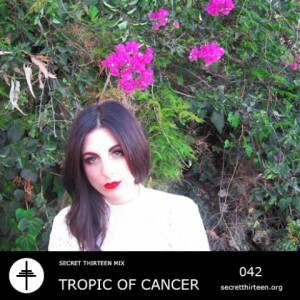 The tracklist features a number of darkside fiends like Silent Servant, Raime, Rene Hell, Collin Gorman Weiland, Chris & Cosey, Demdike Stare, and, of course, Tropic Of Cancer.